KIGALI, Oct 12 2018 (IPS) - In a move to achieve its green growth aspirations by 2050, Rwanda has placed a major focus on promoting project proposals that shift away from “business as usual” and have a significant impact on curbing climate change while attracting private investment. The latest report published by the Rwanda Environmental Management Authority (REMA) in 2015 states that the country needs to adapt – and keep adapting – so that Rwandans can become climate resilient and be assured that they can thrive under changing climate conditions. Rwanda is one of a few nations in the world to develop its own climate-related domestic budget to finance mitigation and adaptation projects and leverage international climate finance. Since it was established in 2012, the National Fund for Climate and Environment, commonly known as “FONERWA”, has played a major role in this country’s climate resilient development by financing various green economy projects. It is also the focal point for channeling international climate finance into projects in Rwanda, while offering technical assistance to project proponents to ensure the success of investments. “Thanks to this expertise, much of the core funding has been allocated to projects on a grant basis, returns are being measured in impact,” Daniel Ogbonnaya, the acting country representative and lead, Rwanda programme coordinator of Global Green Growth Institute (GGGI), in Kigali, tells IPS. GGGI is an international organisation that has partnered with the Rwandan government to help the country access the Green Climate Fund (GCF). The GCF, established by the United Nations Framework Convention on Climate Change (UNFCCC), assists developing countries in adaptation and mitigation to counter climate change. For example, one of FONERWA’s major impacts during the implementation phase has seen over 130,000 green jobs created, nearly 25,000 families connected to clean energy, and approximately 20,000 hectares of land secured against erosion, according to official estimates. Now the East African country which has faced challenges related to the pressures on natural resources from a growing population is relying on FONERWA to implement its national Green Growth and Climate Resilience Strategy, adopted in 2011, to achieve some of its national climate targets. FONERWA, which is the sole vehicle through which environment and climate change finance is channeled, programmed, disbursed and monitored in the country, is also being used by the government as an instrument to facilitate direct access to international environment and climate finance. Government departments and districts can access FONERWA funding. But the fund is also open to charitable and private entities, including businesses, civil society and research institutions. However, to be eligible for funding, proposals are required to meet standard criteria set out for achieving the country’s green growth. GGGI is providing technical assistance to strengthen the capacity of FONERWA in designing world class climate resilience projects and to enhance the fund’s ability to mobilise more resources. The institute has been focusing on providing demand-driven technical advisory services; the development of inclusive green growth plans that are gender sensitive; and the creation of an enabling environment to engage and foster public and private sector investment in green growth. While a significant amount of money has been allocated by FONERWA toward efforts to help mitigate climate change, one of the key criteria for approval of funding proposals was taken into account in selecting public and private adaptation and mitigation projects and programmes to finance. The director general of REMA and also the national focal person of the GCF, Coletha Ruhamya, explained that growth in Rwanda is only possible if the private sector is on board and plays a leading role. “This is because business practice in the country has always been associated with environmental pollution and degradation,” she told IPS. In April, FONERWA proposed a new approach dedicated to encouraging the private sector to take advantage of the existing opportunities in addressing environmental challenges, including climate change. Since its inception in 2012, FONERWA has successfully funded 35 competitively-awarded, high-impact projects to the tune of 54 million dollars and has also received in 2018 another 33 million dollars of earmarked funding from the GCF as the accredited entity’s implementing partner for a new climate-resilience project in Rwanda. However, some stakeholders in the private sector stress the need for serious sensitisation programmes meant for local investors to understand the opportunities that are in the industrial sector through leveraging on the green fund. The chief executive officer of the Rwanda Private Sector Federation (PSF), Stephen Ruzibiza, told IPS that local private investors have a lot to access withinvthe green fund. Currently the PSF is engaging with FONERWA and a limited number of local financial intermediaries to offer long-term loans to private businesses focusing on environmental sustainability with a low interest rate which is fixed at 11.5 percent. The current average lending interest rate for commercial banks in Rwanda is 17.58 percent, according to the National Bank of Rwanda. According to Jean Ntazinda, a consultant with the FONERWA Readiness Support Project, the private sector in Rwanda has so far been left behind when compared to government entities in accessing the GCF financing mechanism. “Although at the national level some private sector projects relating to adaptation got financed, there is a long way to bring the private sector on board due to the lack of another entity accredited by GCF,” Ntazinda told IPS in an exclusive interview. In 2015, Rwanda’s ministry of environment became accredited with the GCF and received a promise of 10 to 50 million dollars in climate finance. It was the country’s first national institution to receive GCF accreditation. In March 2018, the government of Rwanda received an additional 32.8 million dollars from GCF to strengthen climate resilience in Gicumbi District, Northern Province. 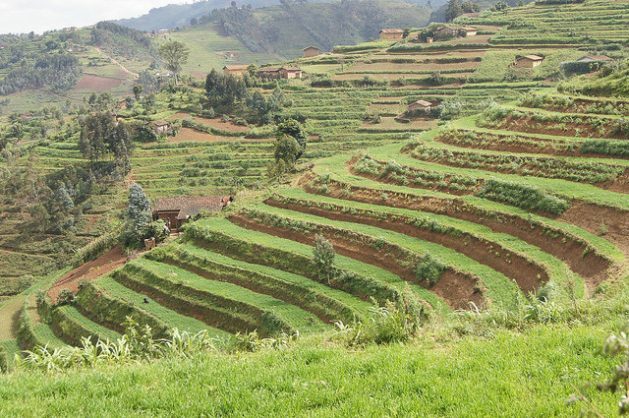 The ‘Strengthening Climate Resilience of Rural Communities in Northern Rwanda’ project, that will run for six years, is expected to invest in climate-resilient settlements for families currently living in areas prone to landslides and floods, and support community-based adaptation planning and livelihoods diversification. Currently FONERWA is in the process of developing several innovative funding mechanisms to finance pro-poor climate projects in Rwanda. For instance, Result-Based Finance (RBF) is one of the approaches currently being used to fund renewable energy mini-grid projects in poor rural areas of Rwanda at a time when Rwandan officials are aiming to achieve 51 percent of electricity access by the end of 2019, from the current 45 percent. RBF are payments that are disbursed at the end of the construction of the mini-grids, provided that pre-agreed conditions and milestones are met. “This incentivises developers to look for private equity and debt to fund the construction costs. And it gives further certainty to the lenders that parts of the debt will be repaid,” Ogbonnaya told IPS. However, Ogbonnaya is convinced that local commercial banks in Rwanda are willing to promote access to private finance for green initiatives, but don’t yet understand the process. “This is because using government or local budget is key to showing country ownership and to showing that a specific project is part of a broader national strategy, but for adaptation funds, co-benefits such as social, environment, gender impacts and pro-poor impacts are so crucial,” he said.